For this post, I am really excited to be featuring some artwork by a contemporary artist! What can I say? While I love to delve into classic religious artwork, I get really excited seeing high-quality contemporary religious artwork. It shows to me that our faith is not dead and that God continues to inspire our artists to create beautiful things in order to sing His praise. I saw this artwork the other day by Michael Felix Gilfedder and I was absolutely floored. Just look at it! 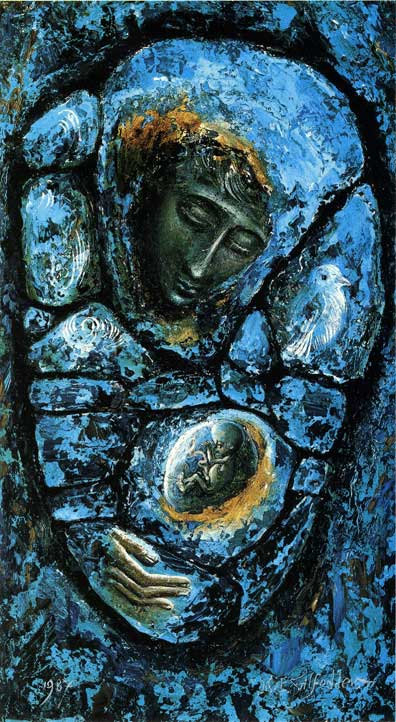 Mary Mother of God (Blue Madonna), by Michael Felix Gilfedder, c. 1980s. Copyright to Michael Felix Gilfedder. Used with permission. High quality print available for purchase here. Look at this artwork and many others at his website at Gilfedder Designs. After talking with him on Twitter (he seems to be a very genuine and kind man!) he graciously allowed me to feature this work on this website. And what can I say? It’s beautiful. Mary is surrounded by what appears to be a living stone, as if she is embedded into the rock of the Church that she watches over today. Yet, the stone is a deep blue that seems to shimmer of heaven. To her right, spirals which indicate the presence of God the Father. To her left, a dove rests near where her left shoulder would be, symbolizing the Holy Spirit that has come upon her. Her hand reaches out to cup her pregnant belly, which seems to bulge out despite the stonework. And, inside her belly, is Jesus, in the early fetal stage, still attached to her with the umbilical cord. The great mystical film “2001 : A Space Odyssey” ends with beautiful and dramatic images of the unborn child, making us think about where we came from, who we are, and where we are going. Ever since seeing the film I have been fascinated by the image of the unborn child made ever clearer by new technologies. After art school I experimented in a new kind of ” Madonna and Child ” icon, trying to show the Christ child in Mary’s womb. I failed. The torso of the Madonna looked as if it had been opened up by a surgeon. I first saw stoney landscape and stone wall formations in the west of Ireland, but only became familiar with them when I came to live and work in South Uist. The east side of the islands are covered in a stoney landscape, with many old buildings with stone formations. From this came the idea of building up a painting of the Madonna in a stone-like formation and placing the images on individual stones. It worked. In the image of the “Blue Madonna” I used the blue colours in order to give it a mystical look. The main formation is in the magnified shape of a woman’s ovum where the egg of life is produced. To the left there are spirals which symbolise God the Father, Christ is in the womb-stone, and to the right is the dove of the Holy Spirit. The hand and face of the Madonna caress and contemplate the Christ child. I admit, when I first saw this picture, I was a bit emotional. After all, I am pregnant with my third child right now, and the image of Jesus in this artwork looks a lot like the image of my unborn daughter that I saw at our previous ultrasound. Just seeing Jesus portrayed in such a similar way took my breath away. Even though Jesus has been depicted as a fetus in art for centuries, it’s powerful to see Jesus represented in such a medically accurate way. While thinking about Jesus, it can be difficult to think that He was ever this way — a mere fetus attached to His mother for His survival. When I tend to think of Jesus being vulnerable, the first thing that I tend to think about is Jesus at His Passion, where He was crucified and died for us. Yet, at this moment when He was conceived, He was incredibly vulnerable too. Mary was probably only a teenager when the Holy Spirit descended on her. According to the world, for all intents and purposes, it was the wrong time to have Him. St. Joseph, as righteous as a man he was, even considered divorcing her! Abortion is hardly a modern occurrence — ancient writers wrote about it happening. Yet, she stood up and courageously protected Him when He was defenseless. Another thing that I loved about this work was how astoundingly pro-life it was. After all, it actually depicts a fetus in the womb in a highly artistic, yet realistic way! And this makes you aware that the humanity and life of Jesus did not start at Christmas. Rather, Christmas is a time when we celebrate Jesus’ first entrance when He physically came out to meet all of us. But, Jesus was with us for longer than that! And it just makes me so happy that there are artists like Michael Felix Gilfedder who are willing to stand up for the truth in such beautiful ways that are accessible to so many people. In these contemporary times, many artists have wandered away from God and embraced postmodernism. To have a skilled and trained artist working for God? What a blessing! Thank You for giving us the capacity to recognize Your Truth in art. Pray for our artists so that they may be able to serve You better by exposing your truth. Dear Karina, hopefully I will now get this posted. As I said I was delighted with your beautiful feature article on Mary Mother of God. When I started reading it I had to stop and ask my wife Margaret to read it out to me. She was also delighted. I started painting the Blue Madonna in April 1987 not knowing that Margaret was pregnant with our third child. I finished it just before Lucy Maria was born and she is now twenty nine, married and has a little boy, Sebastièn Felix, our first grandchild. I am enjoying reading your other articles and would hope they would be used in the schools and other areas of education. There is a great future in what you are doing. Well done! Kind regards, Michael.